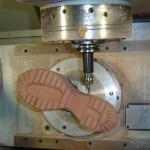 Shoe mold, usually refers to mould of sports shoes, sandals, slippers, and rubber shoes. Sport shoes is the main among all. Mold made from some processes like injection, extrusion, blow, casting, forging, smelting, stamping, and other methods to get the request mold and tool. It needs different design of mold because of different material. RB, EVA, TPR, etc. are popular material for various application. General speaking, shoe mold belongs to injection mold. There are some exceptions, such as CMEVA, which is combined injection and cold press. And some others are made of blow molding.